What used to be a standard and profound craft in the past has nowadays transformed into multiple services which provide shaving (not necessarilly with a straight razor), hair cutting and trimming and hairstyling as such. More than a century ago barbers also provided their clients with special “medical” services, like bloodletting, ulcer treatment or dental services. During feudalism, barbers only operated in bigger cities. In the region of current Slovakia, barbers formed their own guilds along with sawbones in Bratislava, Košice, Levoča and mining towns (which were heavily populated by German citizens). 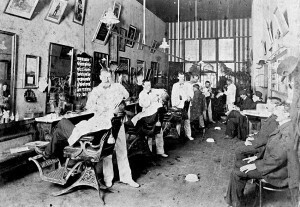 A great expansion of barbers occured at the end of 19th century. In 1890, there were in total 272 registered barbers in 18 Slovak counties, and 932 registered barbers by the year 1910 (which is fearly impressive). Barbershops were in the rise in industrial regions like Gemer, Novohrad, Horehronie or Spiš, where it literally invaded even smaller towns and villages, centering itself around workers’ colonies. Furthermore, barbershops became a standard in spas and bathing centers. By the year 1930, Slovakia had more than 1290 registered barbershops and hair salons, employing 3822 people. This naturally led to foundation of Nationwide Barber Organization. Unfortunately, this craft slowly faded as did many other traditional crafts. Gentleman’s World’s aim is to show people what does it mean to provide exclusive and traditional care for men, in a style own to our forefathers.